Viking history/re-enactment, blacksmithing, woodworking, wood carving, jewelry-making (silver), stained glass. Thanks. Hi Frosty ... life's been busy. I know I've been neglecting IFI ... I've missed it, but time has been a scarce commodity lately. Hopefully things will quiet down soon. Greetings all ... it's been a while since I've posted last. I remember a few years back, someone had posted a list about the different types of steel you could find on a car or in a junkyard. I'm having trouble finding it on this new site format (looks great by the way). Could someone help me locate it? Thanks. WOW!!! I can't believe someone actually said something like that. This is an open forum and everyone has the right to voice their opinion - but that crosses the line. I mean, sure, I've disagreed with things Thomas has said before, and I may have even been the recipient of a less than flattering comment, but no one has the right to tell anyone else to shut-up (except maybe the moderators in a way). 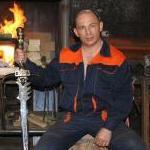 Thomas I have always appreciated your knowledge and skills in the art of blacksmithing. Please keep it up. What do you get when you have 2 blacksmiths who are professionally teachers and who have that same March. Break? A week-long blacksmiths playdate. I'm currently sitting in the Buffalo Airport waiting for my flight to Minnesota to go visit Danr (Dan from Irontree Works) to spend the week collaborating on a project. Best March Break Ever!!! Have I ever mentioned how much I love my wife? Uses of pure graphite in forging? Southeshore I'm with you on this one ... I just don't get it. To each their own. It would be great blacksmith karma if you can buy it and pass it on to a beginning smith at a fair price. That and it would be a really decent, upstanding thing to do. You could become some young smith's mentor. Good luck. Sam. Just thought I'd post this for historical interest. Years ago I bought a repro of a 1908 Sears Roebuck catalogue because our house was built in 1908 and my wife and I thought it would be interesting to see what was available at that time. Here is a page from the blacksmithing section ... it almost made me cry. Yup ... you're reading it right ... Acme anvils sold for 15 cents per pound - this sale ad was for 9.5 cents per pound. Now I know times and costs are all relative, but to hear about anvils selling for 15 cents per pound at any time is still mind-boggling. On other pages, Sears sold complete home blacksmithing kits including a small forge, anvil and a set of tools for $45.00. I want a time machine !!! Sam Hamilton, ON. One other thing ... All those years watching Bugs Bunny cartoons and I've just realized that all the times Wille E. Coyote was mail-ordering stuff to make his traps, he was ordering from Sears Roebuck (... they were the only company carrying Acme anvils). That is SWEET !!! Nicely done. Truely something to be proud of. Sam. Charcoal is pretty much my primary forging fuel so I have quite a bit of experience with it. You may actually have multiple things happening causing all this "sparking" (... I call them fire-fleas). First off, bagged charcoal tends to have a lot of fines mixed in with it and that's just charcoal getting ground together during handling and transport. These tend to be most concentrated at the bottom of the bag, but can be added to your fire every time you up-end the bag and add more fuel. The easiest solution is sift and grade your charcoal. Sift out the fines from each bag of charcoal - some smiths even grade their charcoal, busting up large pieces until they have charcoal lumps about the size of walnuts. It does deliver a much more consistent heat, but the smiths I knowI only do this step when smelting. After sifting and/or grading, you could also store your charcoal in a separate container (- like an old wicker basket) so that you're using a shovel or grabbing handfuls of charcoal to fuel your fire instread of up-ending a bag full. If this is your first time using charcoal and you've learned on coal, I'm guessing you're using a bottom-blast forge. Bottom-blast forges are great with coal because coal is heavier than charcoal. A strong blower on a bottom-blast forge can send sparks, embers and whole coals flying out of a forge because charcoal is less dense than coal. I find side-blast forges work best with charoal. Charcoal CAN be used on a bottom-blast forge, but you have to be more careful - ease-up on the blower or modify your grate to difuse the air more (use smaller holes and more of them). Wetting your charcoal can help a bit in controling sparks, but I tend to use wetting to control charcoal consumption - wet down the carcoal around the outside of the pile that is away from the hot centre to prevent the fuel from being burned up for no reason. Don't give up on charcoal yet. It takes some adjusting to but it is a great fuel to use. It is much cleaner than coal, gives much cleaner welds when forge-weldng, and if you're interested in history, it doesn't get more old-school that charcoal. Good luck. Try changing some of the things I mentioned and see if it helps, but the truth is you're never going to get rid of all the fire-fleas - there will always be some. For me, I tend to forge outside most of the time anyway - so long as I'm not getting embers or coals shooting out of my forge, I tend to ignore the fire-fleas ... they're mostly harmless (... though I did catch one on the tongue last month ...). Cheers. Sam. Hamilton, ON.